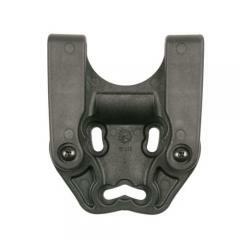 The Mid-Ride Duty Belt Loop from Blackhawk is an economic solution to uncomfortable and ineffective sidearm carry. Finding a holster that offers a secure gun hold, a smooth draw, an appropriate cant and that rides at the perfect level is next to impossible. Sometimes a holster feels great in the store, but after several test runs in the field, does not quite draw as comfortably as intended. Blackhawk's tactical belt loop allows users to adjust the location at which their handgun rests for a more comfortable carry without having to replace an otherwise perfectly useful and broken-in holster. Just what I needed. Fast shipping and great price. Easy to install, put my weapon in the mid ride position from the low ride. Great price too.